Syd included the Khukuri FAQ site in is last newsletter, and when I inquired about it, he said he had just come out of a discussion of the tactical use of Khukuris. Since Khuks are my latest obsession, this hit home. The Khukuri is perhaps the most ancient blade in continuous use and manufacture today. It is thought to have come to Nepal as a local derivation of the Kopis carried by the troops of Alexander the Great, which would give it a Nepali origin some 2,500 years back. It is the common blade of Nepal, made in every village by the local kami (blacksmith) and used daily for chopping firewood, slicing vegetables, clearing weeds from fields. [marijuana grows in cultivated soil to the extent that it chokes out food crops. 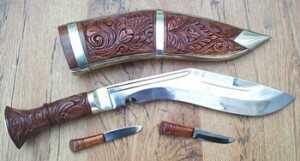 One style of Khukuri is called “Gangaola” or Ganga Chopper. Nepal is so poor that anything that interferes wiath a food crop must go] The blade is found as a strictly utilitarian workhorse, and as a symbol of royalty when made by the Royal Kami for a member of the royal house. The Ghorka mercenaries (Ghurka, if you’re a Brit) brought the blade to fame as a weapon, in hired service to the British and Indian armies. One of the most bloodcurdling things you can witness, they say, is a Ghorka charge. The first Khukuri I saw, years ago, was not impressive. It was, I believe, a “tourist” quality (found in a pawn shop for $10) and I only recently discovered the “real” blades. They are truly awesome. They begin life as aleaf spring from a Mercedes truck, and are hammered into life by kamis who cannot read or write their own language, and are “untouchables” in the Nepali Hindu caste system. Including all sizes and blade styles, there are over 200 Khukuris generally available to collectors/enthusiasts, and more if you care to wait for special orders. They range from about $100 to over $500 (for the special silver-mounted “Kothimoda” styles), and there are variations of sorts from one kami to another on any particular style. Tactical use is moot. Most blades which might be encountered “on the street” are impressive in that they can cut, and most of us have an age old fear of being cut. The smallest Khuk does not invoke a fear of cuts. A 12″ Ang Khola invokes a fear of being dismembered. Bill Bagwell wrote once in a “Soldier of Fortune” column about being perplexed that people did not realize that a Bowie could take off a hand or even an arm. The most unknowledgeable person on earth, facing a Khukuri, has no doubt that this blade can remove anything it hits. A question was raised about the tactics and training given Ghorka troops re the use of Khuks on their enlistment. The brother-in-law of Bill Martino, who runs the site listed below, interviewed 30 to 40 retired Ghorkas on his buying trips around the villages. All gave, basically, the same answer – “Chop to head, chop to chest, cut across legs…All work good!!”. These guys got their first blades from their fathers at four to five years of age, to help in the fields. While the deterrent value of any weapon must not be depended upon when in danger, it never hurts if your blade is the most feared sharp instrument on the block. I’ve centered my collecting so far around the offerings of this fellow: http://members.aol.com/himimp/index.html There are other sources of good blades, but this one employs the Royal Kami as shop foreman, and the sales are run by a guy who left the Peace Corps with a bad taste for their record of accomplishment. I have many superlatives, but to keep it short, these blades cannot be believed until they have been handled. Good blades speak. These say “do not leave me in the sheath too long.” A friend recently wrote in the forum that they must “Dance once in a while with their master”.